Our property is nestled in the middle of woods, so the trendy deer decor is just naturally fitting around these parts. As I prefer to leave the ‘real’ deer heads on the actual animals that frolic in our fields, I thought it would still be fun to add some antlers to our decor; just a little better suited for our living room. I always like to add a touch of whimsy to each room and found a deer head silhouette to perfectly fit the bill; a little bit rustic, a little bit modern and the perfect manly balance to the floral fabric I have added to the space. 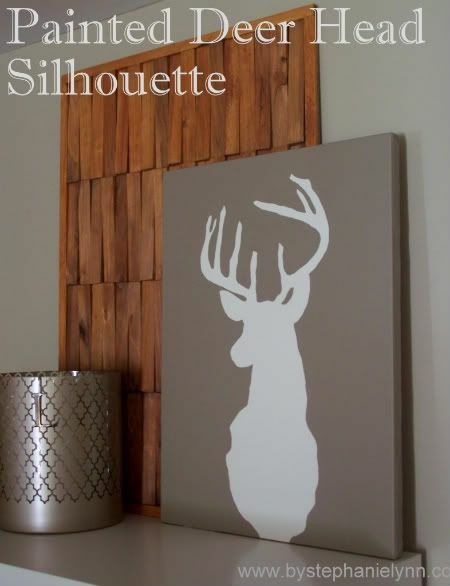 I repurposed a canvas for this project so if deer decor is not really your thing – the same basic concept can be applied to create your own customized piece of inexpensive wall art. I picked up a couple of 18 X 24 painted canvases while visiting my sister last fall, at The Christmas Tree Shop. They were on final clearance marked down to just $1 a piece and with a few strange looks from those around me, I bought every one they had. The frames were actually made really well but the ‘canvas’ itself was poorly stapled to the sides as shown above – a real eye sore. really work. I decided to recover the entire canvas with a piece of inexpensive muslin fabric to give me a nice clean slate to start fresh. 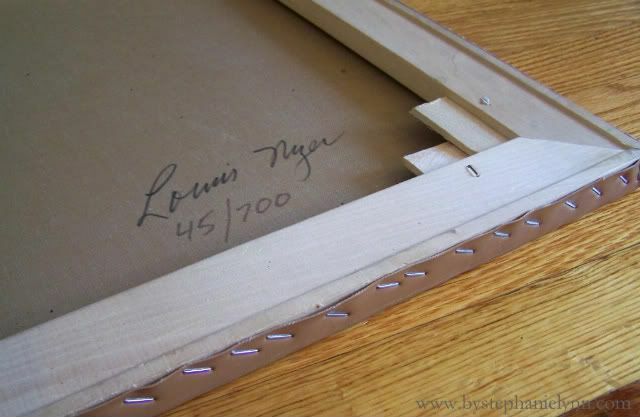 After ironing the fabric, I stretched it over the canvas and stapled it into place on the back of the frame. The excess fabric was then trimmed away. Using a foam roller I applied a base coat of latex paint. It took two coats but covered any of the original design that was peeking through the fabric. The projector was a $10 thrift store find last year and is my little secret drawling weapon. 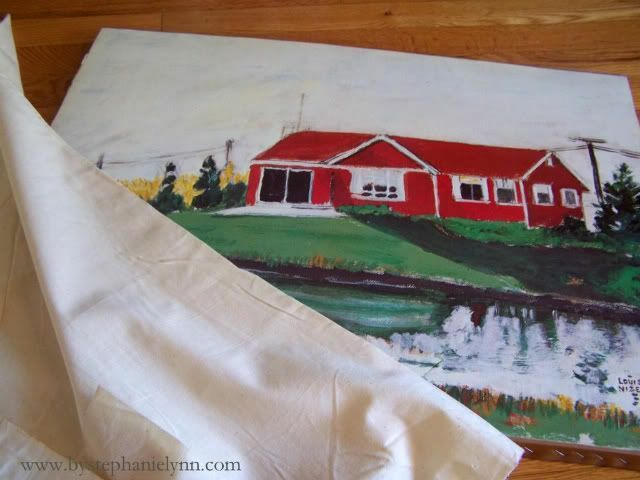 My husband chuckles because he can actually draw but if you’re like me you should definitely add one of these to your thrift store list – they are wonderful to have around! 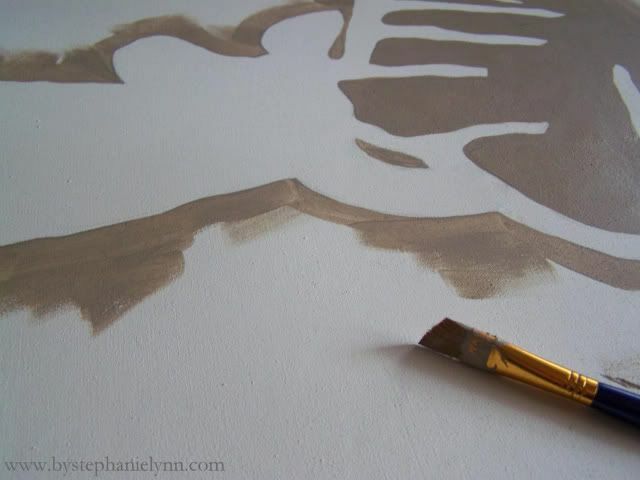 Once I had my pencil guidelines I outlined the silhouette with an angled artists brush. I used more latex paint and it did take two coats to fully cover the base coat. The rest of the canvas and the sides were then filled in with a foam roller. 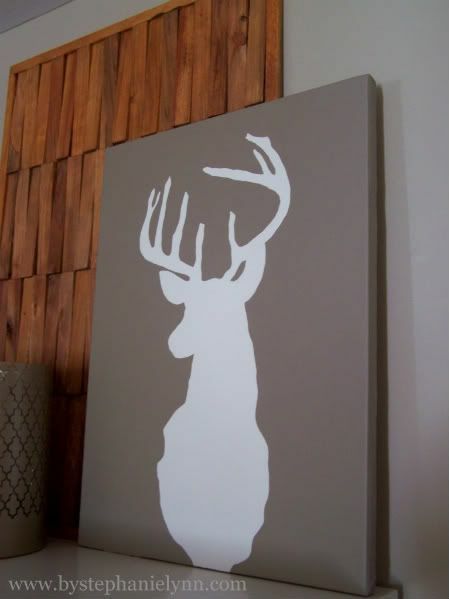 A nice sized piece of customized wall art costing just a few dollars – deer head or not. And once the deer head trend wears thin, the fabric can easily be removed and replaced for a whole new look ~ Enjoy! Fantastic! I did a deer head shilouette to make a cushion this week. I have seen a few overhead projectors at the thrift stores, but they wanted a LOT of money for them. In the meaintime, I continue to use freezer paper, but I’ll keep looking. Very cool! Just in case you don’t know, deer shed their horns every year, so if it’s just horns you want to tuck in here and there, you could probably do some scouting around your place and find some. 🙂 You have such clever ideas! OH! That is AWESOME!! I’m dying for either one like this or a set of antlers! I’m not really into the whole deer head thing, but this one I really like. I would love to see your whole house. You make such beautiful things for it. I love this…I recently purchased a faux deer head (in white) and I have it hanging in our foyer. I surrounded it with a victorian oval frame, also painted white. Just for fun I gave him a garland of crumpled dictionary pages and put a dictionary page ball on one of his antlers. Talk about your whimsy…you either love it or hate it. P.S. I am having a giveaway on my blog…I would love for you to visit! My husband is going to love this! Just wanted to tell you I gave you the stylish blogger award…if you want to participate, copy/paste the award into your blog and have some fun. No biggie if not though, it’s all for fun! This is so cute and I would love to replicate it. 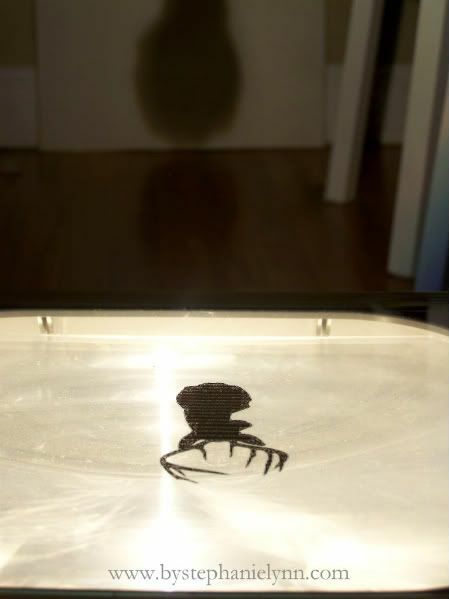 Where did you find the deer art and how did you set it up for your projector? If you could share, I would so appreciate it. Great idea Stephanie! My husband is really into hunting but I’m not into having real animal heads on my walls just yet. I found the same image a while back and will most likely be creating something similar to this to put in “the man cave” in our house! Hopefully that will satisfy us both! That is really neat! I love the rustic/modern feel it has! LOVE this! 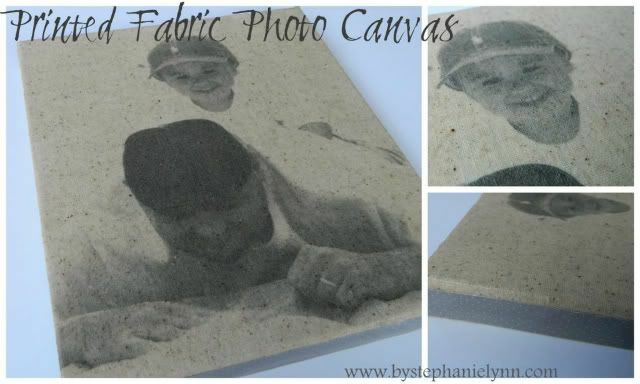 I have a nice sized canvas from my son’s nusery that said “PEACE LOVE BABY” unfortunately he will be turning two this month and is no longer a baby so this is a great way fo me to transform this canvas….Thanks so much for sharing! I love the simplicity of the white deer head against the taupe background but am even more impressed that you repurposed an existing canvas. Very smart! I’m going to have to start looking for big canvases that I can transform. Excellent tips! Thanks so much. I really like the silhouette. It is simple but elegant, and most important somewhat manly, which I really need every once in awhile. Everyone seems to be into ceramic animals but I really think that you are onto something here. That is very cool! I think I need a projector! I totally love it. I also think I need a projector. Thanks for the wonderful idea. Great idea! Rustic, yet a touch of sophistication. Beautiful! Very modern and quirky – love it! This is fantastic! I’m a mom of two boys and have a very manly hubby! This will be the perfect manly addition to our family room once I get my house in June! This is such a cute idea! My husband is a hunter. 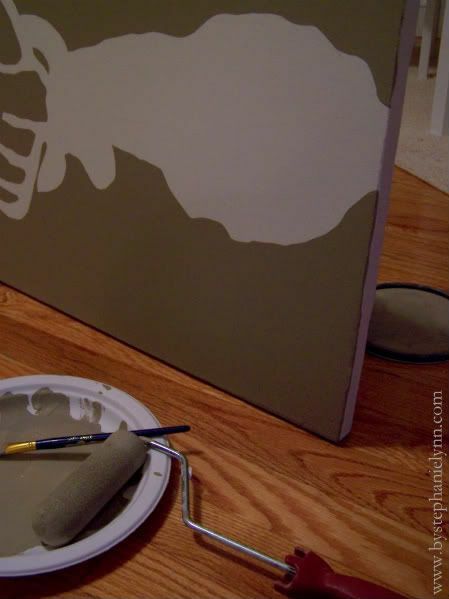 This is a great idea to incorporate him into our home more! Oh my do I love this!! Thank you for the great idea and how to make it. You are lovely for sharing all your great ideas and beautiful inspiration!! I love this silhouette! The x’mas tree shop finds are also ingenious, I would have never thought to cover paintings! 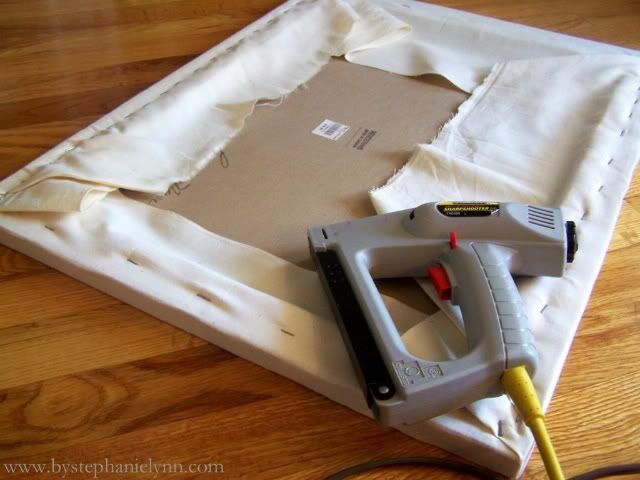 Great tip of putting fabric over a canvas! Love it!! So very creative! I’ve always loved all your projects, really enjoyed this one. 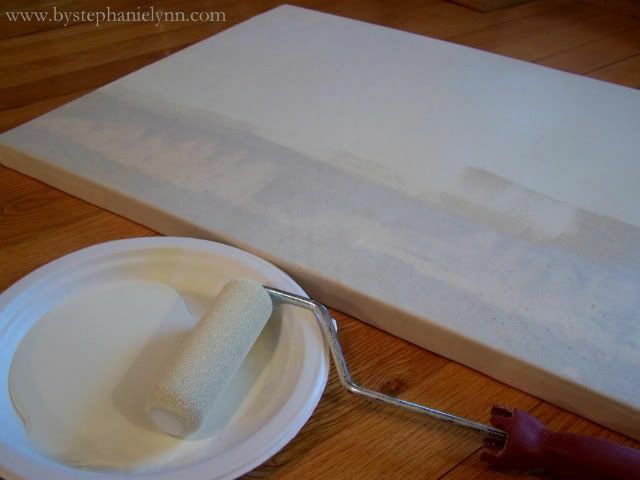 Such a great way to recycle a canvas. So beautifully done. I’m so glad to be back to subscribing to your blog. I had so many problems with our other internet provider so finally gave them the heave ho. Trying to find all the blogs I was subscribed to on it. Hope all well with you and yours. Happy Thanksgiving.